Explosive super-eruptions can erupt up to thousands of km3 of magma with extremely high mass ﬂow rates (MFR). The plume dynamics of these super-eruptions are still poorly understood. 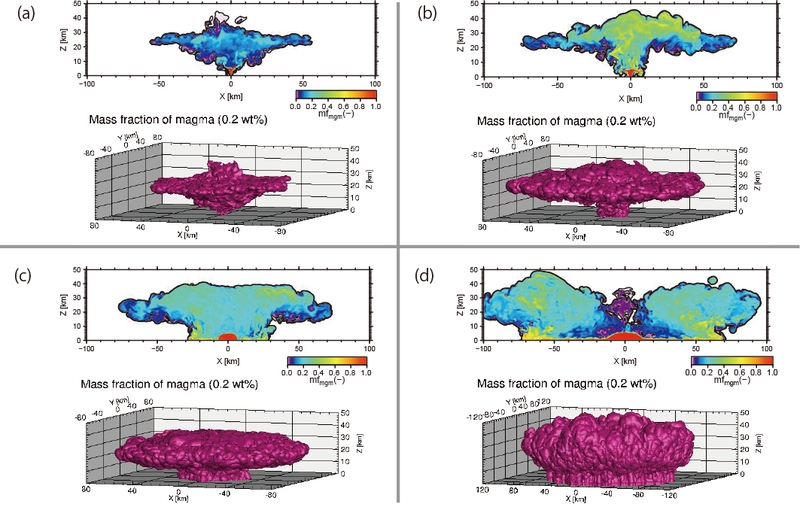 To understand the processes operating in these plumes we used a ﬂuiddynamical model to simulate what happens at a range of MFR, from values generating intense Plinian columns, as did the 1991 Pinatubo eruption, to upper end-members resulting in coignimbrite plumes like Toba super-eruption. Here, we show that simple extrapolations of integral models for Plinian columns to those of super-eruption plumes are not valid and their dynamics diverge from current ideas of how volcanic plumes operate. The different regimes of air entrainment lead to different shaped plumes. For the upper end-members can generate local up-lifts above the main plume (over-plumes). These over-plumes can extend up to the mesosphere. Injecting volatiles into such heights would amplify their impact on Earth climate and ecosystems.